These fun Hoover Dam tours from Las Vegas are probably the most popular day trips in the city. There are multiple ways to get from Las Vegas to Hoover Dam - by bus, Pink Jeeps, helicopter, Hummer and even a biplane! Hoover Dam is the latest man-made construction miracle, located very close to the city, and it's super easy to get there. 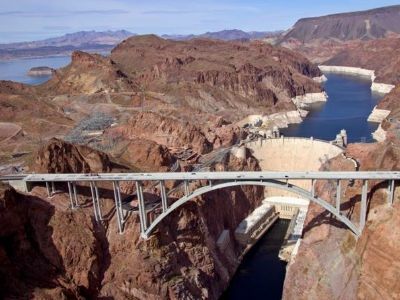 During your tours you will learn fascinating facts about construction of the Hoover Dam during the Great Depression, admire and take pictures of the penstock towers and Bypass Bridge, take a boat cruise on Lake Mead or ride a mountain bike around the dam. The Hoover Dam tours cost from $70 to $249, depending on the mode of transport and what els ethey include. 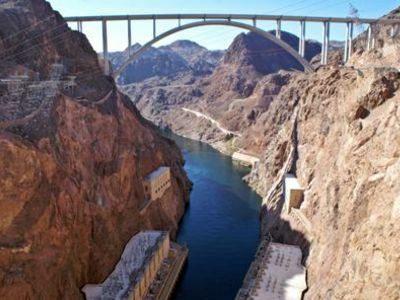 The Hoover Dam Top to Bottom Tour is a great way for you to view one of the most important engineering feats in the world as well as float down the mighty Colorado River. Your 5.5-hour excursion starts with complimentary pickup service from your hotel where you will travel in an SUV to the Hoover Dam. Once at Hoover Dam you will proceed on a guided tour which includes the visitor’s center, the power generating room and you will have time to stroll on top and snap numerous photographs of this beautiful area. After you spend time at Hoover Dam you will then journey to the Colorado River on the same roads that the construction workers used while building this magnificent structure. When you arrive at the Colorado River you will board a raft and float down the river while listening to more expert commentary on the Colorado River, Lake Mead and Hoover Dam. Your Hoover Dam tour from Las Vegas concludes with drop-off service at your hotel. The Super Hoover Dam Express Tour is a fantastic excursion for families that want a quick ride to Hoover Dam, which gives you more time to explore this magnificent facility. Your 4.5-hour tour begins when you meet your expert tour guide at a predetermined location on the Strip. When you meet in this fashion there is not extra time wasted traveling from one hotel to another hotel picking up passengers. You will travel for 45-minutes to Hoover Dam in a comfortable coach while listening to your guide give an informative narrative of the natural and cultural history of the area. Once you arrive at Hoover Dam you will follow a National Park Service guide who specializes in the history of Hoover Dam. You will stroll through the visitor’s center, watch a historic video of the construction and eventually reach the top where you can gaze around and take in the fabulous views. When you are finished with your 45-minute Walk on the Top Hoover Dam tour you will be transported back to your original pickup location where your Super Hoover Dam Express Tour will conclude. When you want to see spectacular scenery combined with one of mankind’s greatest engineering feats then you should try the Grand Canyon West Rim Hoover Dam Combo Tour. Your 10.5-hour excursion begins with a complimentary continental breakfast before you board a 10-passenger Tour Trekker vehicle which is designed for off-road adventure and sightseeing. As you travel through the Mojave Desert you expert guide will keep you up to speed on all the exciting landscapes and landforms as well as the cultural history of the different places you will visit throughout the day. After a quick stop at Dolan Springs you will continue to the Grand Canyon’s West Rim. Once at the West Rim you be thrilled with the beauty of the area as you gaze down into the Grand Canyon. Here you will indulge in a free lunch from Hualapai BBQ. 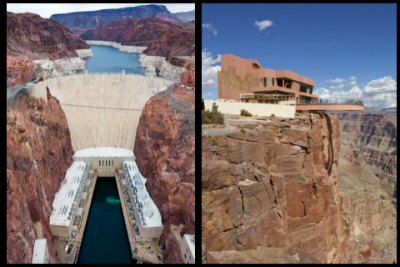 Your final stop will be the Hoover Dam where you will have 2-hours to explore everything from the bypass bridge to the Colorado River and Lake Mead to the power plant to the visitor’s center where numerous interactive exhibits explain how this incredible piece of engineering was completed. Your exclusion concludes when you return to Las Vegas. 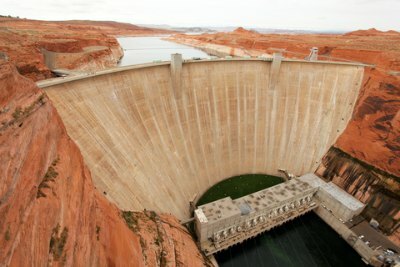 If you are looking for an interesting and unique way to view Hoover Dam and Lake Mead, then you must try the Lake Mead Cruise and Hoover Dam Discovery Tour. Your 7.5-hour excursion starts with pickup service from your hotel where you will be transported to Hoover Dam on a comfortable coach. Once at Hoover Dam you will have sufficient time to marvel at this grand feat of engineering. 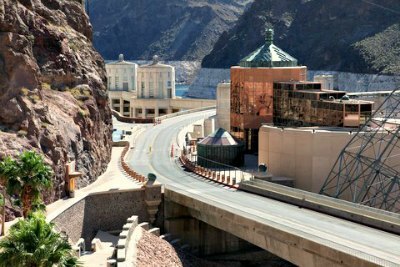 You will stroll through the visitor’s center where you will watch an informative video on the construction of the dam, take a trip to the generator room and stand on top of Hoover Dam snapping as many photographs as you want. After your guided tour of the dam, you will board a unique Mississippi River-style paddle boat named the Desert Princess. You will enjoy all the sights of Lake Mead while this multi-level paddle boat cruises the gorgeous waters. You will have exceptional views of such sights as Boulder Island, the Arizona Paint Pots and Sentinel Island. On the paddle boat you will be served a complimentary lunch that is sure to please. Your last stop of the day for this Hoover Dam tour from Las Vegas will be at Ethel M Chocolate Factory and the Botanical Cactus Gardens. Your tour concludes with drop-off service at your hotel. 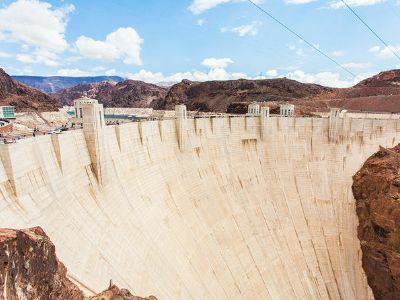 This Las Vegas to Hoover Dam Tour is sure to please everyone in the family as you stroll through one of the world’s most impressive engineering feats. Your 4.5-hour excursion begins with complimentary shuttle service from your hotel where you will travel to the bus depot. From the bus depot you will ride in comfort in an air conditioned coach while you listen to interesting facts from your expert guide. Once at Hoover Dam you will be greeted by a Department of Reclamation tour guide who will take you for a fascinating inside look of this magnificent structure. You will view the visitor’s center, watch a video on the construction process and even walk through the power plant with its many turbines. From here you will take a stroll on the top where you can stand in Nevada and Arizona at the same time as well as take as many photograph of Lake Mead. Your Hoover Dam Bus Tour concludes with complimentary drop-off service at your hotel. Maybe you've always dreamed of visiting the Grand Canyon, and are not that much interested in Hoover Dam, but would like to know what's the buzz about? This is a prefect tour for you! This is a bus tour to the Grand Canyon that includes a short stop at the Hoover Dam so you could take pictures and tell your friends that you've "been there done that"! During this fun Las Vegas to Hoover Dam tour you will explore all the fun points of the Grand Canyon West Rim - the Eagle Point Indian Village, the Wild West show and lunch at the Hualapai Ranch, plus you will have an option to go on the Skywalk - the new bridge/platform with a glass floor from where you can see the perfect view of the canyon. Tour guides conducting this tour know their facts and figures by heart, and they are willing to share them with anyone who will listen! 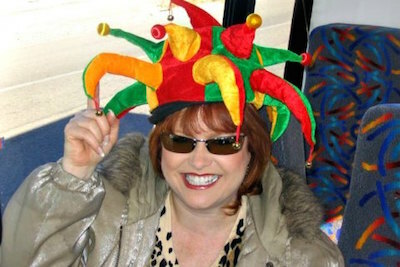 If you are looking for a fun, entertaining and memorable history lesson - this is your tour! This extended tour is different from other Hoover Dam tours from Las Vegas primarily because it's really long, thorough and this is one and only tour that offers a guided 45 minutes walk on top of Hoover Dam. It also includes free lunch, a tour of the Visitor Center, a visit to a Chocolate Factory, and a Hoover Dam Engineering Tour - a Power Plant Tour organized by the Government, where you can get a close look of the generators. Ride a trike and see the magnificent Hoover Dam from a different angle! No licenses are needed and your guide will give you a full briefing and orientation lesson before setting off. The trike has two wheels at the back and is suitable for all ages and levels of fitness. See the panoramic views of Lake Mead and the Memorial Bridge. Cross over the Dam and experience the exhilarating feeling of being out in the open on a trike. The trip offers rest breaks where you can get to know your fellow travellers. It takes five hours with three spent on the trike. Not to be missed Hoover Dam tour! When you want to combine a few laughs with interesting history, then you should book the Hoot and Hoover Dam Tour. Your 6.5-hour excursion begins with complimentary pickup service at your hotel where you will then be transported in a comfortable coach to Boulder City. While driving you can listen to expert commentary of the cultural and natural history of the area as well as enjoy plenty of jokes from you’re your professional comedian tour guide. Once at Boulder City you will take a guided tour of the Boulder City/Hoover Dam Museum before going to Hoover Dam where you will stroll through the power plant and take a walk on the top of the bridge where you can snap numerous photographs of the surrounding area including fabulous views of Lake Mead. Your last stop includes playing Las Vegas trivia while you enjoy a complimentary lunch at Ethel M Chocolate Factory. Your Hoot and Hoover Dam tour concludes with more comedy on the drive back to your hotel. This Hoover Dam Hummer Tour is an ideal way for you to view what many engineers around the world claim to be one of the world’s seven wonders. 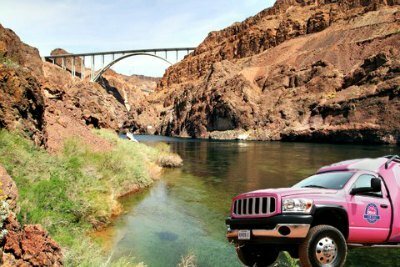 Your 4-hour excursion begins with complimentary hotel pickup from where you will be transported to Hoover Dam in a state-of-the-art Hummer H2. During your drive you will sit comfortably in the Hummer H2 you will listen and view an informative video of the construction process of Hoover Dam. Once at Hoover Dam you will proceed to take an elevator some 500-feet into the hydro-electric plant within Hoover Dam. From here you will follow your expert guide to the top and walk through the exhibit gallery located within the visitor’s center. Now that you are back on top of Hoover Dam you will be amazed at the incredible photographs you can snap while viewing the Colorado River and the Black Canyon where numerous species of wildlife such as desert big horn sheep can be spotted. Your Hoover Dam tour by hummer concludes with complimentary drop-off service at your hotel. Want to ride for the day in some of the best scenic and interesting terrain in the country? Then, the Hoover Dam tour by mountain bike is for you. Start with complimentary hotel pick-up service that will transport you to Hoover Dam. After being fitted with equipment and a short safety session, you will begin with a slow descent down to the Lake Mead Visitor’s Center with your experienced trail guide. Once at the visitor’s center you may choose to continue a short distance for a quick dip in the Lake Mead or stroll through the amazing museum. From here you will travel through tunnels that were used during construction to bring cement trucks to Hoover Dam. Once at the dam you can choose to relax, take some photos or attend an optional tour of the dam (additional fee). After you enjoy a box lunch you will be transported back to your hotel. Minimum age for this tour is 14 years old and persons under the age of 17 years must have a waiver signed by a parent or guardian. Close-toe shoes are required. 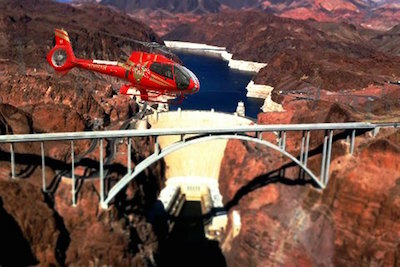 If you are looking for a short and exciting Hoover Dam tour for your family, then try the Lake View Helicopter Tour. Your short flying journey starts when you arrive at Papillon Helicopters and board a customized tourist helicopter. Your flight includes a compelling narrative of the cultural and natural history of the area by an expert guide, flying at heights of 2,000 feet for 5-miles during your 3-minutes of airtime. You will have the opportunity to view the massive Lake Mead Recreational area and the monstrous Colorado River as you snap photographs of the beautiful scenery. Your Lake View Helicopter Tour concludes when you and back at Papillon Helicopters. 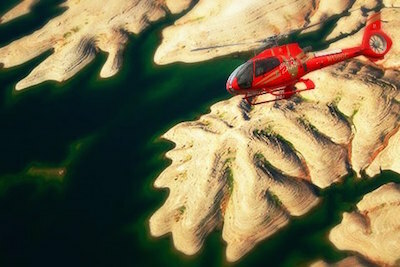 When you are looking for that unique family Hoover Dam tour and you feel like flying high then the Black Canyon Helicopter Tour is perfect. Your exciting helicopter tour begins when you arrive at Papillon Helicopters where you will board a specialty helicopter that allows for excellent sightseeing from each seat. You will travel at heights of 2,500 feet as you fly over 20-miles on this 10-minute excursion. During your flight you will enjoy an expert narrative about the cultural and natural history of the Lake Mead area. You will travel over such iconic landmarks as the Hoover Dam, Lake Mead Recreational Area, the Colorado River and the spectacular volcanic cliffs of Black Canyon where you can take photograph after photograph of this stunning landscape. Your exciting Black Canyon Helicopter Tour concludes when you land at the Papillon Helicopter center. 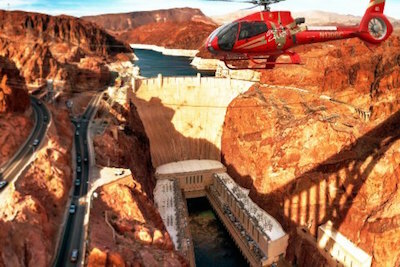 Take a few minutes to explore with your family as you take an adrenaline filled Hoover Dam Tour by helicopter. Your short excursion will begin when you arrive at Papillon Helicopters where you will board a state-of-the-art helicopter designed specifically for tourism. You will lift off from the helipad to begin your flying adventure. You will travel a total of 10-miles and at heights of 2,500 feet during your six-minute flight which is accompanied by expert narrative about the historic features of the area. While you are soaring in the sky above, you can take numerous photographs from your custom seat and enjoy the beautiful Mojave Desert scenery. You will also get a chance to peer down at Hoover Dam, Lake Mead and the newly constructed O’Callaghan-Tillman Bridge. Your Hoover Dam Tour by helicopter concludes when you touch down safely at the Papillon Helicopters helipad. If, you are looking for more adventure then combine this with upgraded services which include a 2-hour float trip down the mighty Colorado River. 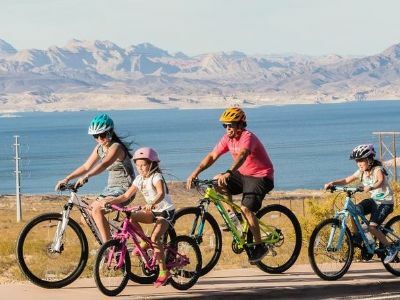 The Hoover Dam and Lake Mead Bike Tour is great for all skill levels of bikers and this family-friendly adventure takes you through stunning desert scenery before enjoying excellent views of Lake Mead and Hoover Dam. 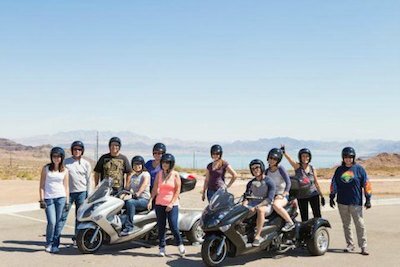 Your 6-hour Hoover Dam tour begins with complimentary hotel pick-up service where you will be transported to be outfitted with all the necessary riding and safety equipment you will need for your adventure. After you watch a short video and meet your expert guide you will begin your bike riding adventure along the original railroad bed that workers used to transport materials while constructing Hoover Dam. You will follow your guide as he explains interesting facts about the history of Mojave Desert, Hoover Dam and the historic railroad. As you peddle you will be able to see all different species of wildlife from red-tailed hawks to big horn sheep to quail. While you continue with your gradual 2,000-feet descent you will pass through five tunnels before reaching the shores of Lake Mead. Once at the lake you can indulge in a complimentary lunch and snap as many photographs as you wish. From here your Lake Mead and Hoover Dam tour by Bike Tour concludes with drop-off service at your hotel. 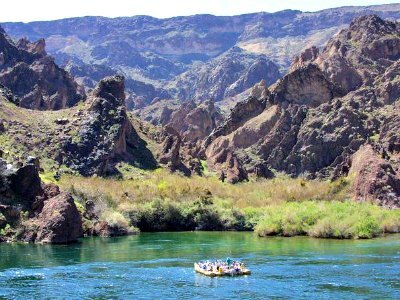 The Black Canyon River Rafting Tour is the best way to relax and view the wonderful scenery of the Colorado River as float effortlessly down the monster river. Your 8-hour excursion begins with hotel pick-up where you will be driven to be outfitted with all the necessary safety equipment for your adventure. After watching a short safety video you will enter the water with your expert guide. As you float down the river your guide will explain numerous interesting facts on the natural landscape and the history of the Colorado River. 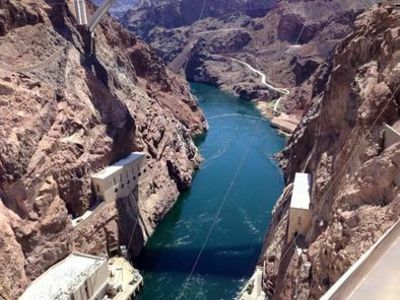 This Hoover Dam tour is spectacular and you will be in awe as you view upward towards the giant walls of rock within Black Canyon trying to see an osprey, blue heron or a desert big horn sheep climbing on the sheer rock cliffs. After a bit of paddling you will stop at shore for more photographs opportunities of the desert scenery and Hoover Dam or you can take a quick swim. This is also where you can indulge in a complimentary lunch to keep your strength up to normal. Your floating portion of the excursion stops at Willow Beach where you will disembark your raft and have a chance to browse a little shop with unique souvenirs of your rafting adventure. Your Black Canyon River Rafting Tour concludes with drop-off service back at your hotel. The ATV Tour of Lake Mead and Colorado River from Las Vegas is an exhilarating way for you to explore the surrounding landscape while you ride on an ATV. Your 6.5-hour tour begins with hotel pick-up where you will be transported to your ATV starting point. You will be fitted with a helmet and watch a short safety video before you set-out on your ultimate adventure in the Mojave Desert. From here you will drive through Lake Mead National Recreation Area on your way to the Colorado River. When you are driving you can enjoy the picturesque scenery while your expert guide explains the history of the area. Once at the Colorado River you will have the opportunity to snap some photographs and even swim if the weather is permitting. After a quick dip, you will start back on the trails on your ATV and once back at our headquarters you will be served a complimentary lunch of a hamburger, fries and soda. Your Hoover Dam tour is complete with a stop at Dam itself for some more great photograph opportunities before being dropped off at you hotel. Guests must be 16 years of age with a valid driver’s license to drive an ATV and children under the age of 18 years old must be accompanied by a parent or legal guardian. 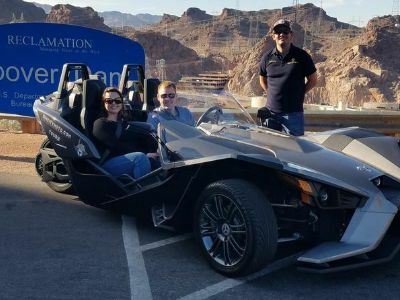 If you want to feel the wind rush through your hair while driving a unique Bat Mobile-style vehicle through the desert scenery, then you should try the Polaris Slingshot Hoover Dam Tour. Your 4-hour driving adventure begins when you arrive at SinCity Moto Polaris Slingshot where you will be given a brief driving lesson on how to drive this powerful 180-horsepower vehicle. Once traveling on the road, you will follow your expert guide through the Mojave Desert letting the throttle rip as you drive towards Boulder City, Hoover Dam and Lake Mead. As you drive the scenery is spectacular along Lake Mead where you follow the Colorado River while listening to commentary from your guide over headsets. You will stop at the scenic Lake Mead Lookout for great photo ops before cruising over the O’Callaghan-Pat Tillman Memorial Bridge where you will stop for incredible views of Hoover Dam as well as the Black Canyon and some quick history of the dam from your guide. Your excursion concludes when you arrive back at SinCity Moto Polaris Slingshot. One of the best Hoover Dam tours that you can choose several exciting add-on options to help create your own experience is the Hoover Dam Tour from Las Vegas. This adventure varies in time length depending on which of the three packages you select. The first option is a 4-hour excursion to Hoover Dam where you will spend 2-hours. 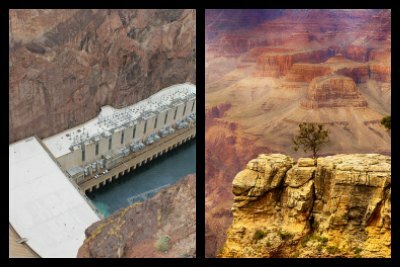 During your time you can walk to the Observation Deck for great photographs of the dam, Colorado River and Black Canyon. From here you can go to the visitor’s center to watch a short video on the construction as well as walk through the interactive exhibits and the generator room which is packed with large turbines. Your second option includes 2-hours at the dam with additional time spent having lunch at the Hoover Dam Lodge and a stop on the way back to your hotel at the Ethel M Chocolate Factory. 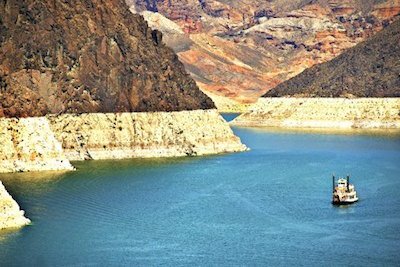 The third option is loaded with fun and includes 2-hours at the dam as well as a 90-minute cruise on Lake Mead aboard a Mississippi-style paddle boat that includes a picnic lunch while you take in the sights of the largest manmade lake in the Western Hemisphere. Added bonuses for all three options is complimentary hotel pick-up/drop-off service and a photo op at the Welcome to Fabulous Las Vegas Sign. 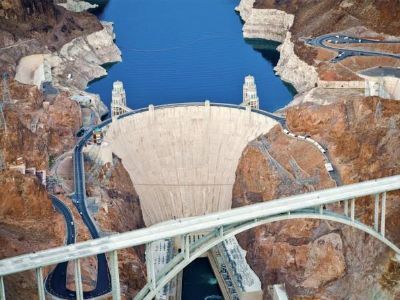 If you are searching for a great family-friendly Hoover Dam tour that has multiple departure times to fit your busy schedule, then you should try the Deluxe Small-Group Half-Day Hoover Dam Tour from Las Vegas. This 4-hour journey begins with free hotel pick-up service where you will meet your informative guide and be transported to Hoover Dam. When you arrive at the dam you will stop at a couple of lookouts including the O’Callaghan-Pat Tillman Memorial Bridge for great photograph opportunities of the dam, the Colorado River, Black Canyon and Lake Mead. Once at the dam you can take a guided tour of this engineering marvel that supplies electricity to some 8,000,000 people in three states. Inside the visitor’s center you can watch a video about the construction of the dam and stroll through the many interactive exhibits as well as the generator room where large turbines crank out power. After leaving the dam you travel to the Welcome to Fabulous Las Vegas Sign for another great photo op before you are transported back to your hotel. An action packed Hoover Dam tour that has you handling high powered weapons and gives you the ability to add-on more exciting options is the Outdoor Shooting Range Package from Las Vegas with an Optional ATV and Doors-off Helicopter Tour. Your experience begins with complimentary hotel pick-up service where you will be transported to Hoover Dam. Here you will have time to take numerous photographs before heading out to a nearby military-style shooting range. 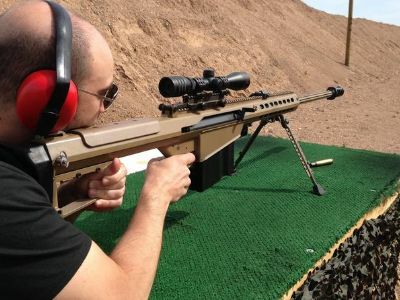 Once at the shooting range you can select from five shooting packages that range from firing a sub-machine gun, machine gun and Glock to eight machine guns of your choice, a sniper rifle and a M2 Deuce .50 Cal BMG. Each package is specially designed to give you a Desert Storm experience on the shooting range and there are plenty of photograph opportunities while you are firing away at the targets. When you finish shooting you are treated to a free lunch. 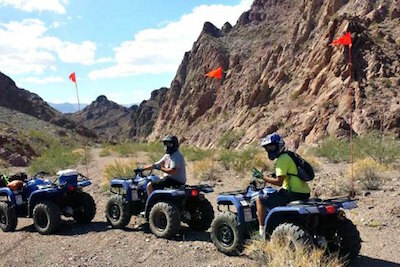 There are two add-on options for this excursion that include a 22-mile ATV ride in Lake Mead National Recreation Area where you will follow the banks of the Colorado River or a doors-off helicopter flight to the Grand Canyon where you will land on the canyon floor for a toast with champagne. Many people decide to book both add-on options and go for a whole day of adventure while they visit Sin City. Your excursion concludes with drop-off service back at your hotel. An ideal Hoover Dam tour that is perfect for people who don’t want to spend all day away from Sin City is the Hoover Dam Mini Tour. This 3-hour excursion starts with complementary hotel pick-up service where you will be transported to the Welcome to Fabulous Las Vegas Sign for a few quick photographs. From here you will travel directly to Hoover Dam and pass over the Mike O’Callaghan-Pat Tillman Memorial Bridge. When you park you can walk along the bridge and take in the spectacular views of the Hoover Dam, the Black Canyon and the Colorado River while you snap several photographs. Continuing onward you will make a stop at the Lake Mead Lookout where you will witness the largest manmade body of water in the Western Hemisphere. After a couple more stops at various lookouts along the dam for more photographs your excursion concludes with drop-off service back at your hotel. If you are looking for a Hoover Dam tour that is packed with everything from riding an ATV to shooting powerful weapons, then a great excursion to try is the Shooting and ATV Tour from Las Vegas with an Optional Doors-off Helicopter Flight to the Grand Canyon. Your 7-hour adventure starts with free hotel pick-up service where you will meet your expert guide and be transported to Hoover Dam where you will have time to snap a few photographs. 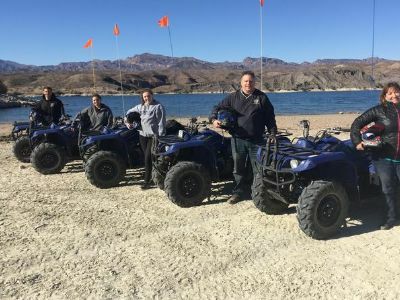 Your next stop will be Lake Mead National Recreation Area where you will be outfitted with an ATV and embark on a 22-mile ride along the Colorado River. The ride is perfect for viewing the beautiful landscape and if the weather is warm you can take a quick dip in the river. After arriving at a local restaurant near the lake, you will indulge in a complimentary lunch before setting out to the shooting range for some high powered fun. There are several packages you can select at the shooting range which will have you handling everything from an AK-47 to a 9mm Glock to a variety of sniper rifles. There is a great add-on option for this tour which is a doors-off helicopter flight to the Grand Canyon where you will land on the canyon floor for a champagne toast before returning. Your excursion concludes with drop-off service back at your hotel. 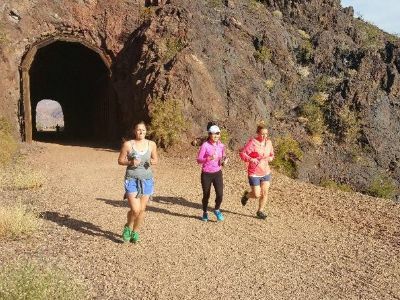 A unique Hoover Dam tour that is perfect for fitness buffs and trail runners of all skill levels is the Las Vegas Trail Run Tour. Your 4-hour journey starts with complimentary hotel pick-up service where you will meet your running guide and then be transported to the Historic Tunnels Trail. Once at the trail head, you will stretch out before embarking on your 8-mile run that takes you through a series of tunnels as you follow an old railroad line. As you run you will follow the old railroad line that was in operation to construct and maintain the Hoover Dam from 1931-1961. The railroad line was decommissioned in 1961 and turned into a recreational trail that was eventually placed on the National Register of Historic Places in 1984. While you are running you can take in the breathtaking scenery of Lake Mead below and the mighty Colorado River as it travels through the Black Canyon. When you pass through the fifth tunnel you will begin to arrive at the dam, where you can run across and stand in the state Arizona for a quick photograph as well as spend time gazing at the dam up close. Your excursion concludes with drop-off service back at your hotel.